Provide a replacement for our leased remote data facility due to the exorbitant yearly lease costs and the slow performance. The system currently allows members of the nation-wide sales force to go online and enter orders directly into the collection system, which is transmitted, to Johnson & Johnson HO daily. Designed and developed a notebook based “Order Entry” facility to allow the sales representative to enter orders in an offline mode and transmit a collection of orders to HO when convenient. The system utilised the corporate email facility to transport the order packages from remote locations via cell phone to the HO processing platform. All HO processing services were automated to immediately transport orders to the corporate HO in Australia transparently. 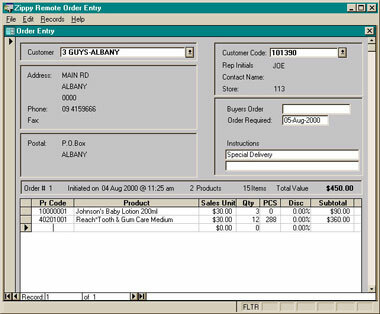 This system was originally developed in 1996 and at last check was still in use today by all company representatives on the road.